Germany - For the first time there is a compact laser multi-chip package. Osram Opto Semiconductors can pack up to 20 blue laser chips in the new PLPM4 450 module. Instead of taking the laborious approach and constructing a light source from individual laser diodes, it is now possible to reduce the complexity of laser projectors significantly. Developers also succeeded in doubling the optical output of the individual chips, with the result that the new laser module now offers an overall output of 50 W. This means that professional laser projectors can achieve a brightness level of more than 2000 lumen with only one component. Osram Opto Semiconductors is strengthening its leading position in light sources for laser projectors with its blue PLPM4 450 multi-chip package. Osram developers are the first to adapt the "butterfly" package for projection applications. The result is an extremely powerful laser module which can be more easily integrated in projectors. Its package measures 25.5 by 35 millimeters (mm) and accommodates four copper bars with up to five blue laser chips connected in series and operated at 2.3 A each. This multichip product offers a light output of 50 W from a typical electrical input of 165 W, with wavelengths of 440 to 460 nanometers (nm). It achieves an efficiency of 30%. Blue laser diodes in combination with a converter wheel, which converts part of the blue light into the two primary colours of red and green, are used as the light source for laser projectors. Up to now, to achieve sufficient brightness for professional applications more than 20 individual laser diodes had to be combined. With its impressive optical output of 50 W the new laser module offers projection brightness levels of more than 2000 lumen from only one package. 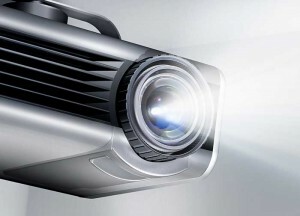 If several modules are installed in a projector brightness levels far in excess of 5000 lumen are then possible – for example for devices in large conference rooms. To achieve the high optical output of the PLPM4 450, developers at Osram Opto Semiconductors optimized the chip parameters to double the single-chip output from 1.6 to 3.2 W and also improved the thermal resistance of the module. This unique technical performance is particularly attractive, and so too are the costs for the new laser module. Thanks to the special design and the improved optical output power of the individual chip, the price per optical watt could be significantly reduced. Another price benefit comes from the greatly reduced production costs – installation and alignment of a multi-chip package involve less time and lower costs than for a large number of individual TO packages. The radiation from all the laser chips can therefore be collimated with a single lens array. "The innovative package simplifies the integration of laser technology in projectors considerably, enabling a breakthrough in the projection market," said Stephan Haneder, marketing manager at Osram Opto Semiconductors. Volume production of the PLPM4 450 will start at the end of 2014. Samples will be available from the summer. The Osram Specialty Lighting Business Unit will also be integrating the multi-chip package in a new generation of phaser light modules for projection applications. Phaser in this case is a hybrid word formed from phosphor and laser. Phaser light modules based on the multi-chip package will feature a particularly compact design and will be capable of being used in combination, making them very easy to integrate in existing projector architectures.